Heat oven to 375°F. Spray 10-inch skillet with nonstick cooking spray; heat over medium-high heat until hot. Add ground beef and onion; cook and stir until beef is thoroughly cooked. Drain. Stir in all remaining ingredients except biscuits. Heat to boiling. Reduce heat to medium-low; cover and cook 10 to 15 minutes, stirring occasionally, until vegetables are tender. Spoon into ungreased 8-inch square (2-quart) or oval (2 1/2-quart) baking dish. Separate dough into 5 biscuits; cut each in half. Arrange, cut side down, around outside edge of hot mixture. 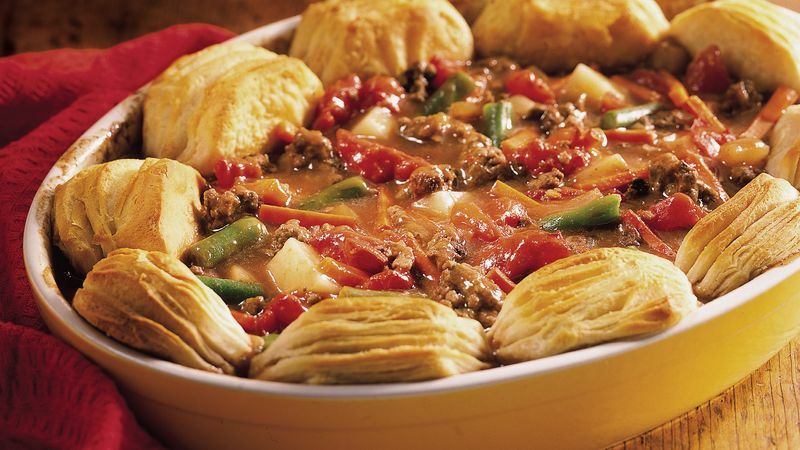 Bake 20 minutes or until casserole is bubbly and biscuits are deep golden brown.